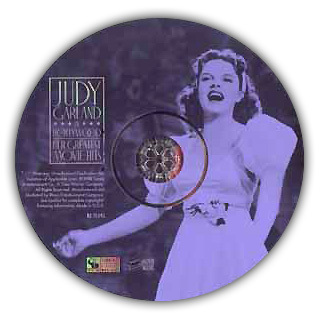 To date, this is probably the best overall single disc compilation representing Judy Garland's career. It's certainly the best single disc compilation of her movie work. All of the tracks are classic Garland. Placed in chronological order, the tracks give the listener a chance to hear Judy go from "little miss leather lungs" to a vocalist beyond peer. The disc starts with Judy's first feature length film, Pigskin Parade made on loan from MGM to 20th Century-Fox and ends with her last feature film I Could Go On Singing (MGM/UA). In between we get the "best of the best" in terms of not just Judy Garland but also the film musical. If anyone asks "what made Judy so great" or "I haven't heard much of her stuff" - then THIS is the disc to have them listen to. 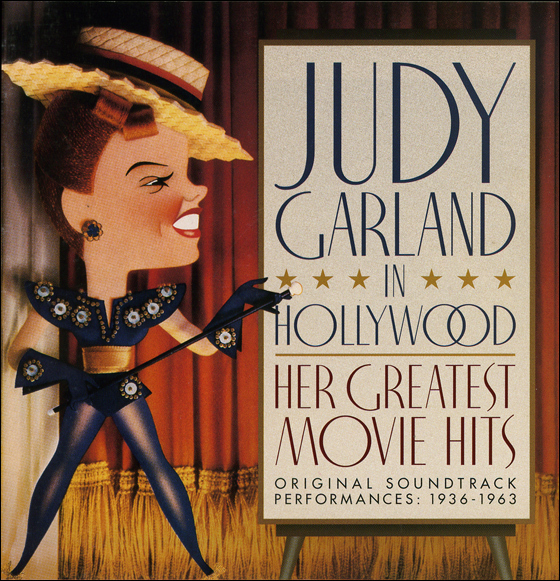 Whether the track is Judy pouring her heart out to "Dear Mr. Gable," expressing boundless happiness in "The Trolley Song," or singing the ultimate torch song "The Man That Got Away," this disc proves that Judy Garland was the greatest film musical leading lady of the 20th Century. The version of "For Me And My Gal" heard here is the best sounding version put on disc to date. On the For Me And My Gal soundtrack released by Rhino in 1996, the song has been remixed to stereo, but the quality is such that the music during the vocals and the dance break sound "faint." This is rectified here - the number has been remixed into a crisp and clean sounding mono track. A definite improvement. The version of "You Made Me Love You" heard here is the song as it's performed in the film. The previous CD release of the song on the That's Entertainment! (box set) used an alternate ending that differed from the version heard in the film. 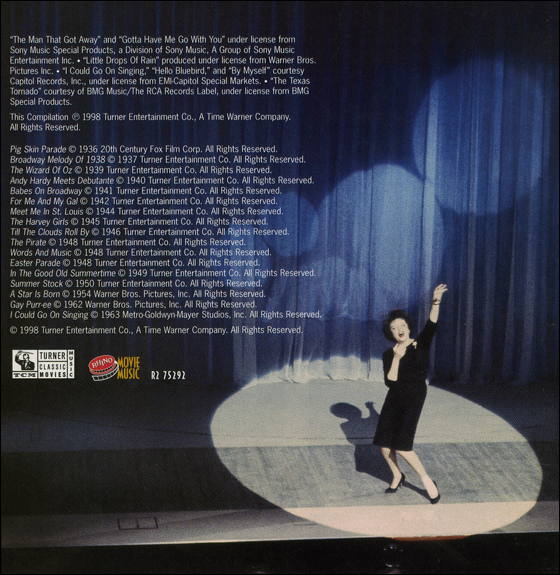 Originally, this CD was to end with Judy's final pre-recording for a film, "I'll Plant My Own Tree," recorded for her aborted role in Valley Of The Dolls (20th Century Fox), in 1967. But the producers of the CD decided that the number wasn't up to her usual standard and would not make a good coda for the CD. 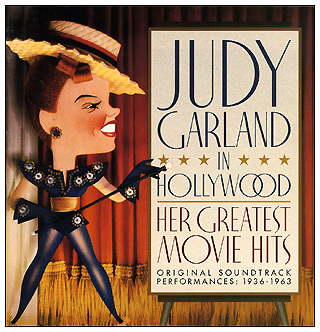 Besides, Judy only completed the song and a few costume tests before walking off the picture - rumors abound about the studio firing her because of unreliability and drugs, but the general feeling is that she realized that the film was basically pulp trash and not something she'd want to be involved with. The pre-recording of "The Texas Tornado" heard here, as well as the pre-recording for one of Judy's other songs from the film "It's Love I'm After" first appeared in the Smithsonian 4 CD boxed set "Star Spangled Rhythm - Voices of Broadway and Hollywood" ( 1997 BMG Special Products/The Smithsonian Collection of Recordings RD 111/ RD 111R/RP 0044/DMC 4-1450). According to the liner notes for that release, the recordings were taken from the original studio playback discs "recently discovered in New York." Also in the set are several tracks from MGM soundtracks courtesy of Rhino/Turner Entertainment, including "The Trolley Song" from Meet Me In St. Louis. Songs making their Rhino CD debut here: "The Texas Tornado," "F.D.R. Jones," "Look For The Silver Lining," "Mack The Black," "Johnny One Note," "Last Night When We Were Young," "Happy Harvest," "Friendly Star," "Gotta Have Me Go With You," "Little Drops Of Rain," "Hello Bluebird," "By Myself," and "I Could Go On Singing." "Over The Rainbow," "For Me And My Gal," "Look For The Silver Lining," "Mack The Black," "Johnny One Note," "Happy Harvest," "Friendly Star," & "Get Happy" were previously released by Sony Music Special Products in the late 1980's and early 1990's as a part of their MGM Soundtracks series - but these were inferior quality recordings taken directly from the sound tracks of the films, not from the prerecordings. This disc is a sort of companion disc to the previously released Judy Garland - Collector's Gems from The MGM Films (Rhino R2 72543). "Gems" is a two disc compilation of mostly previously unreleased-on-CD MGM pre-recordings. It contains mostly rare and little known Garland songs - including her first real assignment for the studio - the short Every Sunday with Deanna Durbin. What's interesting is that "Gems" was released a full two years before "Judy Garland In Hollywood". Usually, the demand for an artist's "greatest hits" is higher than that for the rare stuff - especially when, as in the case of Judy Garland at MGM, most of the songs hadn't yet been released. But the folks at Rhino really knew what they were doing - especially producers George Feltenstein and Bradeley Flanagan - when they released "Gems" with collectors in mind. CLICK HERE to read this CD's Producer's Notes. Tracks in Stereo noted with asterisk (*) - All tracks from MGM films except where noted. "This collection represents nearly 30 years in the motion picture career of Judy Garland, beginning with her rousing "The Texas Tornado" from 1936's Pigskin Parade, her first feature film, and ending with her ultimate semi autobiographical performance in 1963's I Could Go On Singing. In between, the listener travels through her varied and splendid career at MGM to the triumphant A Star Is Born at Warner Bros. Although countless Garland albums and compilations have been prepared and issued in the years since her death, perhaps no one single album presents such a comprehensive overview of her film work. It contains most of her famous film musical performances, along with a few choice rarities, many of which have not been commercially available for years. In all cases, the highest quality elements were sought to provide the best-possible listening experience. 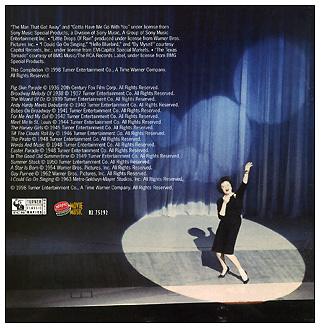 All selections were derived from original prerecording source elements, with the exception of the two tracks from A Star Is Born. Both were transferred from Warner Bros.' 4 track magnetic stereo studio print, the only surviving stereo recording source. In the case of "The Man That Got Away," this presented no problem, in that there were no extraneous effect to get in the way of the music. "Gotta Have Me Go With You" posed its own problems, as there are several plot-related screams and noises during the song as it is presented in the film. In order to maintain the aural integrity of the performance, a portion of that track was derived from the original mono soundtrack album master recording." Photographs Courtesy of Turner Entertainment, Co., George Feltenstein, MGM Clip+Still, and Warner Bros.